Bring all new flavors to your specialty drink menu with this Torani chocolate milano flavoring syrup! This tempting flavor will complement your beverages without overpowering them or being too sweet, while the user-friendly bottle will be convenient for your busy baristas to use. Torani flavoring syrups are specially formulated to resist curdling in milk and to hold up well under heat, making them the perfect choice for espresso-based drinks, brewed coffee or tea, and more. Use this flavor for frappes, iced coffees, smoothies, and even baking! Torani chocolate Milano flavoring syrup brings the rich, decadent flavor of dark chocolate to any drink. Discover new Torani recipes for this flavoring syrup, including chocolate Milano cappuccino, fudge ripple mocha, hot fudge topping, iced bittersweet chocolate latte, raspberry chocolate kiss martini, and more! Chocolate Milano adds a sweet chocolate flavor to drinks. Pair it with Torani's Irish cream for a tasty combination. Thank you for taking time to package this product thoroughly, we have never had one come to us broken! I bought this looking for a good “mocha” flavor. It’s a little thicker syrup than the others and it’s really good. Not the MOST popular but we do make several of them everyday. Who doesn't like a Mocha Latte?!?! This chocolate Milano syrup is amazingly good. Works well in hot and cold drinks. We also drizzle it on desserts. 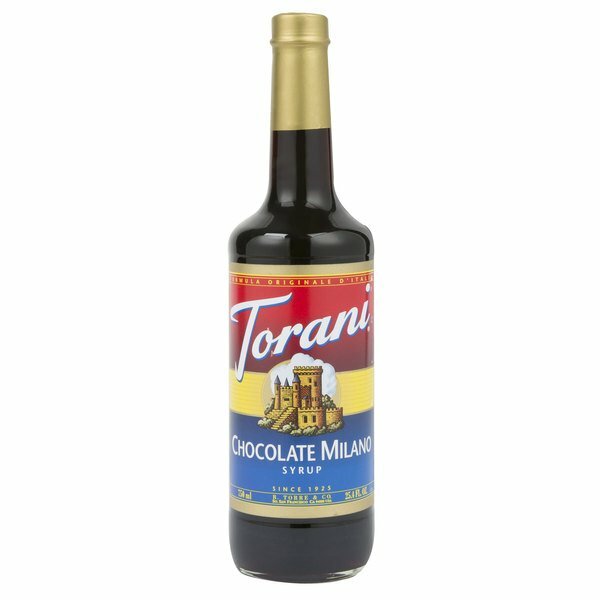 We use this Torani Chocolate Milano Flavoring Syrup very often at my cafe and it adds the perfect touch to our coffee! I would definitely recommend this product. WebstaurantStore always has fast shipping and is consistently reliable! The chocolate Milano flavoring syrup is great and very tasty and it makes a great flavoring for our coffee drinks. The syrup is bold and very delicious. Chocolatey and creamy! This syrup is so much better than using Hersey’s with our lattes. It’s got a very smooth flavor and brings out natural chocolate tones in our coffee. This is my hands down favorite coffee/ice cream syrup flavor. 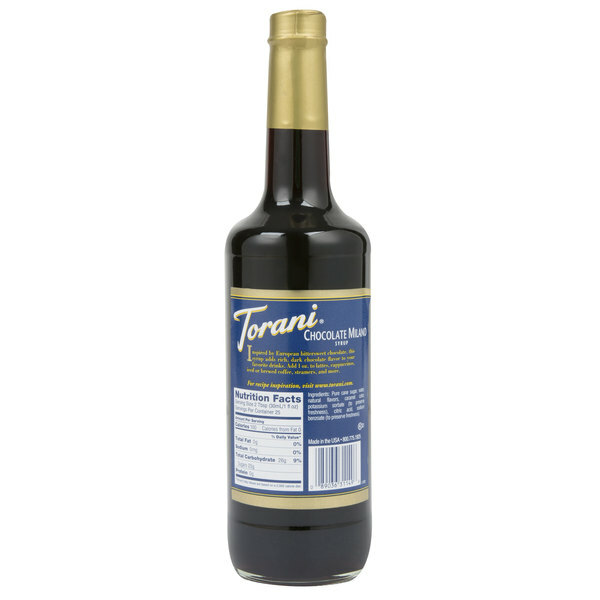 Torani does an amazing job with this - it is reminiscent of a European dark chocolate liquor. And amazingly the Webstaurantstore sells it in glass bottles still! You can’t beat the price or service here. I’ve ordered a case at times, and to come very well packed. I love using this syrup in frozen espresso drinks. The added syrup enhances the flavor to really make it stand out. Mocha Grande to the taste buds. This thick syrup is a bit different from most Torani Syrups. Once you play around with it there's some very yummy drink creations you can make! I made one today with white chocolate and raspberry. Great February drink! This takes chocolate flavor to a different level. If you love the cookie of the same name you will also love this syrup in your coffee or shake! You know those Pepperidge farm Milano cookies? yeah well this Torani 750 mL Chocolate Milano Flavoring Syrup taste just like those, I was worried it would fail the test and just ruin it, but they did a GREAT job emulating the taste. nicely done. Ok I love the Pepperidge Farm Chocolate Milano cookies so that is the reason I decided to give this syrup a try. Holy Cow it is soo good. The flavor is great and makes a mean coffee. Tastes just like a chocolate Milano cookie. You only need one or two pumps if you are using it in your coffee so the bottle lasts a good amount of time. This one however isn't as popular in my office and the "original" flavors like caramel or hazelnut. Torani syrups are very delicious and add just the right amount of flavor to my coffees, cappuccinos, or iced mochas. The chocolate milano is one of our favorites. This is an amazing flavor. Mix it with seltzer to create a fabulous drink. For even more fun, add in white chocolate and chocolate chip for a great triple chocolate soda. There was a little issue with receiving this product because the package got damaged in shipping. I had to call them for them to ship it back but did receive it quick after that. So far so good with this flavor. This is definitely one of my favorites. Torani's chocolate Milano is definitely one of my top sellers. It has a wonderful smooth taste and mixes well with almost anything! This flavor is aimed at those that enjoy a more sophisticated palate of taste for chocolate. I am not too sophisticated and don't enjoy it that much. It makes a drinkable soda but leaves an residue at the bottom of the cup. It's ok.
All in all a very good syrup. It blends really well with other syrups and espresso. It has a nice chocolate flavor that isnt overpowering. We started with ordering one bottle at a time now I'm order 2-3 bottles every 2 weeks. We use this for our milkshakes and absolutely love it no complains. Great taste of chocolate every pump. Syrup pump fits perfectly with the bottle. It comes in a safe package. I am pleased that the bottle was delivered undamaged. The Torani line of syrups are a great addition to those who enjoy the occasional (or many daily in my case) espresso drink. This particular chocolate flavoring does have a slight, candied artificial taste, but it is still a great tasting syrup. And the wonderful pricing here cannot be overlooked. This is a fantastic syrup. Top quality components and a top quality taste. I had originally thought the Creme de Cacao was going to be my favorite, being the darker of the two, but this contrasted wonderfully to a double shot of espresso and steamed milk. I'll be buying more in my upcoming order. An excellent product, as expected from Torani! I have recently started using this syrup in my husband's iced coffee because he absolutely loved the flavor. He use to just add regular chocolate sauce to his coffee, but after trying this, he decided he wouldn't ever be doing that again. The flavor of the syrup mixes much better with the coffee! It's a really great product. This is a very good tasting coffee syrup. The flavor is similar to the beloved cookie by the same name. Very tasty when added to whipping cream! I love using this in chocolate desserts and that is what I specially use it for. The flavor is great and this is a trusted brand that truly delivers quality products. Love this and use this a lot. Will be re-ordering. Torani's Chocolate Milano flavored syrup adds a buttery and rich dark chocolate touch to any of our beverages- from iced to frozen to hot. It is silky sweet and delicious.